If you are like me and like to follow the latest trends, then you know been seeing a lot of gold. Gold is considered to be one of the hottest trends right now, and just a touch will add that luxe feeling to any space. Gold accents and accessories, gold nail head detailing on furnishings and gold finishes and trim on pillows, draperies and even gold jewelry is becoming more popular once again. The same can be said for print. Make Your Print Shine with Metallic Ink. Looking to make a big impression with your next print project? 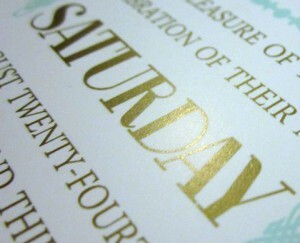 When plain black or colored ink just won’t do, and you want to venture beyond the familiar territory of CMYK, it may be time to consider incorporating some custom printing finishes to add that little extra pizzaz — think spot colors, embossing, foil stamping, spot varnish, and of course, metallic inks. Metallic Madness – Metallic inks are special inks with fine reflective metallic particles that create a shine and luster. Silver and gold metallics are most common, but metallic inks also come in bright blues, vibrant purples, sizzling reds and burnished coppers. Metallic inks are perfect for presenting that high-end image because they add attention-grabbing shine to any printed piece. There are a variety of different ways you can incorporate metallic inks into your print materials. « Kiss those stamps goodbye!